Starting January 17, the Vasari Corridor will once again be open for special visits. This is a wonderful opportunity to get into and view the special art collection along the corridor, as well as experience the view of Florence as the Medici saw it! The special visits are offered directly by the Superintendance of the Florence State museums several times a week up until April 27 at a very low rate of € 10,50 per person. The visits are for small groups of less than 5 and are perfect for couples. They are, unfortunately, only in Italian, but if you don’t mind this or know a bit of Italian, this is the best way to get into the Corridor as it isn’t open all of the time nor to everyone. The only way to generally see the inside of the Corridor is with tour groups that cost from € 80-100 per person, so this opportunity is really good for this reason. To reserve your spot (better do so quickly as they often get booked quickly), you need to call +39-055-294-883. Days for the visits are: Tuesdays and Thursdays at 9am and 11:30am; Wednesdays and Fridays at 2pm and 4:30pm. 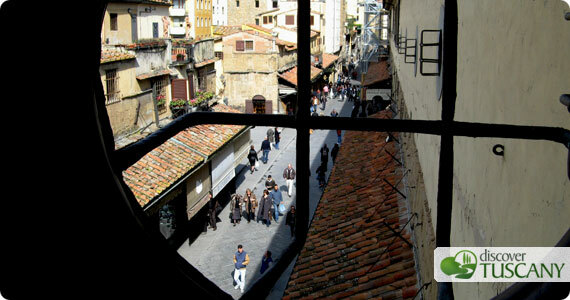 Learn a little more about the Vasari Corridor here.